Nearly 8 years ago I was where you are now, in pain, exhausted and barely coping with everything I was meant to do. I had no one to understand and my doctor didn't have anything for me to try. I was too exhausted and trying so hard just to live to have the ability to research and properly experiment with the options. It took me a very long time and a lot of trial and error to get to where I am now - thriving despite fibromyalgia. I want to try and help you reduce your journey. My blog, Melissa vs Fibromyalgia is featured as one of Healthline's Top 19 Fibromyalgia Blogs of 2019. My YouTube channel was also included in Feedspot's Top 15 Fibromyalgia YouTube Channels list. I have written two books: Melissa vs Fibromyalgia: My Journey Fighting Chronic Pain, Fatigue and Insomnia and Pregnancy and Fibromyalgia. I facilitate two Facebook groups: Melissa (you) vs Fibromyalgia and Fibro Mama Pregnancy and Fibromyalgia. In addition I have created a free micro course and the Fibromyalgia Framework Workbook. The purpose is to use my experience, and our collective group experience, to help you take control of your healing journey. To stop waiting for your doctor to come up with a magic fix (there is none). To start building the multiple layers towards wellness (it is complex and takes time). This is the intermediate level programme where we assume you have tried some things already and are ready to learn more and try more. 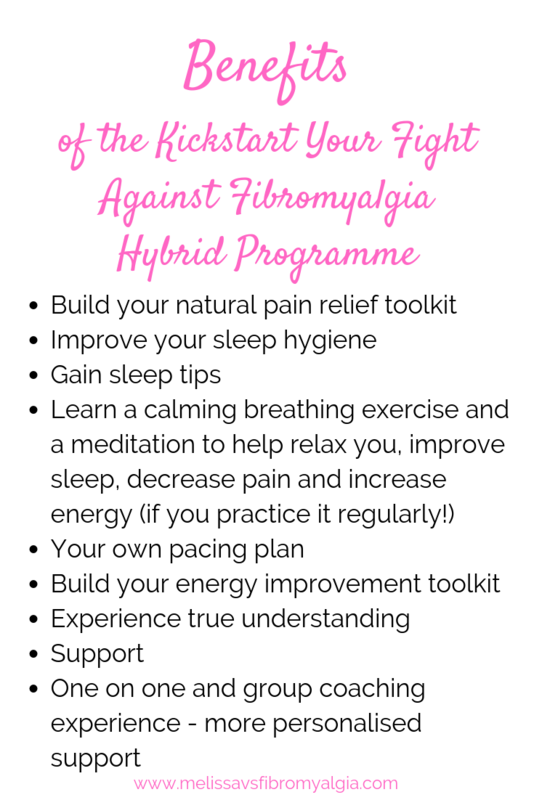 Perhaps you have completed the Kickstart Your Fight Against Fibromyalgia Group foundation programme and are ready to kick up the fight a notch. A closed Facebook group with Q&As, content of interest and the opportunity to chat with the other team members and share your progress - this is part of the magic of the group programme! In short...a supportive, collaborative eight weeks to help you learn, plan and do to fight fibromyalgia. Giving yourself a few hours per week to attend sessions, participate in the Facebook group and take the time to set your goals and plans will be a surefire way to get the most out of it. This programme takes into account the fact that time and energy are limited but also that it will take time to improve our health. So what is my investment? A supportive, collaborative eight weeks to help you learn, plan and do to fight fibromyalgia. Information, tools, support - concrete help to reduce the symptoms that interfere with your life. 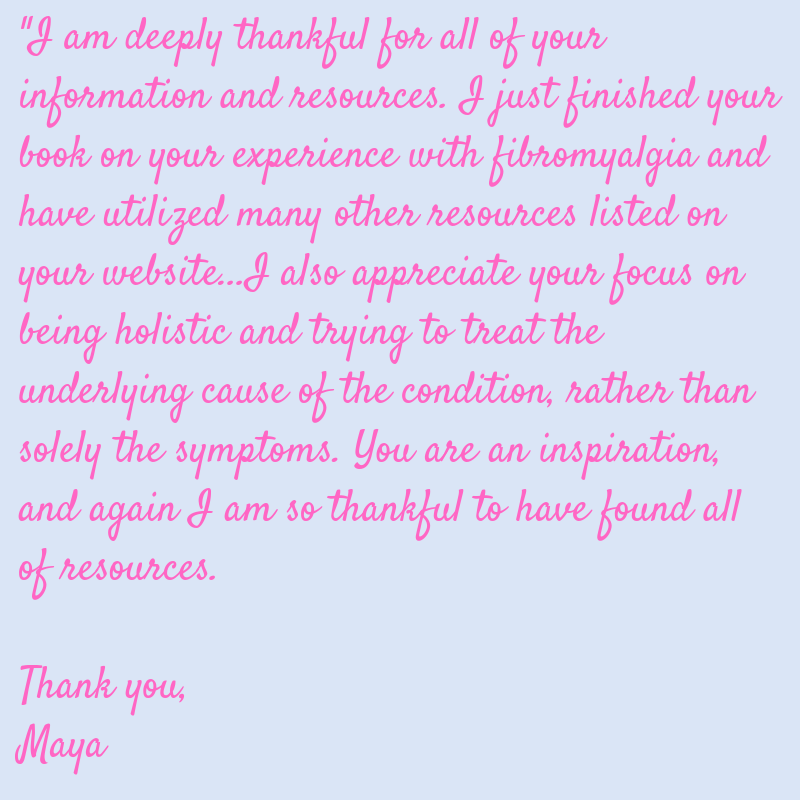 With a value of over $450, PLUS a free copy of my ebook Melissa vs Fibromyalgia: My Journey Fighting Chronic Pain, Chronic Fatigue and Insomnia for the first enrollments. This special programme is available for just $329 NZD. If you were to work with me 1-1 it would cost $540 for the eight week programme - without the benefit of the group. I have worked long and hard with my own personal journey and with my life coach certifications - you will have access to all of this knowledge without having to go searching for it yourself like I had to! You also won't have to create your own ways to log your progress and lists of options for sleep, pain relief and meditation. Open for a maximum of 10 people. So grab your place now! If you need to pay by monthly installment please email me hello@melissavsfibromyalgia.com. We will go through the programme together from May 1 for eight weeks (to the 26th June). After our programme finishes you will continue to have access to the group and content. Let's be real: The level of benefit depends on the amount of effort you put in. It is expected that you present plans we make to your doctor for approval, specifically where medicines are concerned. In this way you utilise your short appointments with your doctor well. I believe we can make a huge difference to our quality of life, both in mind and body, but it takes time and experimentation. I am a coach, not a medical professional and I can't guarantee more than that I will turn up, come alongside you and help you do the work - and I will do this! I will give you the results of my personal experience and research, encourage and support you. Because that is the most anyone can do. Day to day, it's on you. If you genuinely give this programme a go (participate in the group sessions and Facebook group and try some of the ideas offered in the first two sessions) and don't think that this programme can help you, I will refund your enrollment fee in full. I really believe you will find benefit from the first session! Schedule your complimentary chat if you would like to ask any questions, let me know your goals and be sure that this programme is a good fit for you. PS. click buy now to join us in this special programme - enrollments close soon for our 1 May start date! I am so looking forward to getting to know you and helping you!